Learn some simple, highly effective strategies that prepare the body and baby for birth. There are specific ways to jiggle and use a rebozo that help with posterior, ascynclitic and breech presentation of babies. Jiggling and rocking also support the body to release tension and optimize pelvic space in labour. Be prepared to feel deep in your body, the soothing expansive bliss of being jiggled, rocked and relaxed, and learn how to offer that experience to others. Jenny and Fiona will also be offering a Post~Conference, 1 day workshop called 'Understanding the Cervix and her support team'. Between them, Jenny and Fiona have 60+ years experience of working with birthing women and their bodies, and facilitating workshops. 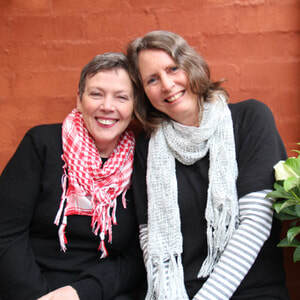 They are highly intuitive and skilled bodyworkers with a particular fascination for exploring and understanding women’s bodies in relation to birth. They have assisted an enormous number of women to connect with, understand, admire, prepare and heal their sacred pelvic space. Their workshops are an extraordinary blend of pelvic anatomy, body knowledge, body awareness, bodywork and profoundly attentive touch – as it relates to all pregnant women. Jenny is a mother of 3, grandmother of 2, independent birth worker, educator, bodyworker, author & film maker.